This is the way Aussie songstress Clare Bowditch has introduced media to her brand new music, prefaced by the single ‘Bigger Than The Money’, which has been serviced to Australian radio this morning. But that’s not the end of her comical story-telling. It continues. About the song, she says, “‘Bigger Than The Money’ is a song about me and my friend Randy*. One night, after a massive bender, we both got a little bit overtired and grumpy and started fighting about who should pay for my last drink. Now normally, I would offer, because I’m really really rich. On this particular morning, however, I wasn’t going to budge, mainly because I was annoyed at him for leaving me at the bar alone whilst he talked to some “lady” about “business interests”. Whatever. “Anyway, I got so angry and righteous that I lost my voice, literally. I went to a European Doctor (being in Europe at the time you see), who gave me an official note stating: “This woman cannot talk, whisper, or make any noise, under Doctor’s orders”. Although I am naturally rebellious, so I defied the Doctor and made up this song, “Bigger Than The Money”, which I whispered into a secret recording device on my phone. In the end, Randy* and I decided that instead of fighting, we should just leave the bar quickly. We also have plans to donate the four euro to charity, at some later date. Last I heard Randy was doing just fine. And so am I. So there you are. 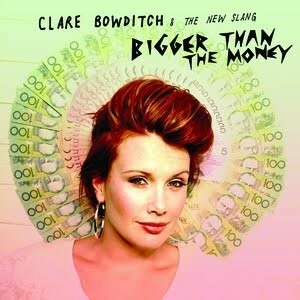 ‘Bigger Than The Money’ is the first single lifted from Clare’s new album ‘Modern Day Addiction’, due on August 21. The clip for the new track will be revealed later this week.